the nominations for the swiss blog awards 06 are now open and are all the rage! 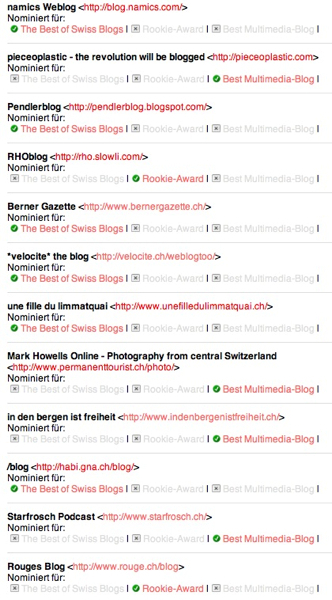 so go and nominate your favorite blogs in the swiss blogosphere! oh, and mark the fifth may in your calendars. update: you can see my nominations (for the moment) in the screenshot on the left. and if you want to nominate me, just click here. Hast du nicht den leumund.ch vergessen?